I'm still plodding along on my 2008 digital layouts. Since I'm still working on summer layouts, I'm a little worried that I won't be able to get my photo book done in early January as planned. I'm excited about having this blog though, because in a way I'm scrapbooking my life as I go and I'll have that blog book in my hands in January for sure. 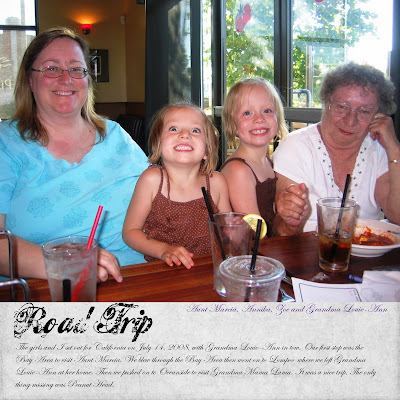 This is the first page of our summer trip to California and I have a few pictures from that trip. It'll do me good when the weather is chilly though. In the meantime, I plod along . . .
That is some intense pool fun:-) What a great page!! Great memories. I wish I was only a few months behind in my scrapbooking!! Good for you! CUTE, cute...you do the greatest scrapbook pages. I LOVE them! I love the idea of a blog book. That's one reason I blog. 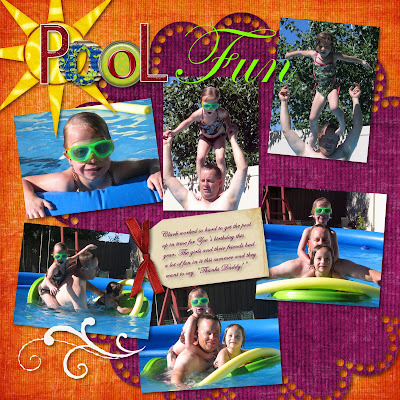 I can't keep up with scrapbooking although it may be easier if I took up digital. Your pages are beautiful! those little mosters do alot! I love this page. I really enjoy pages that have one large photo on them, and the photo on this one is so fun!